Testing is an essential part of the software development. In recent years software testing has become a profession and career path. 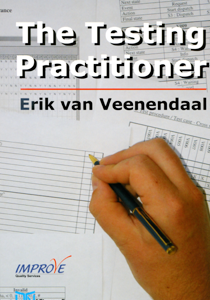 The Testing Practitioner provides a comprehensive description of the state-of-art in software testing and in addition addresses a number of new challenges and topics for the test practitioner. Offering insights from leading experts in testing, each chapter in this book has been extensively reviewed for technical content, assuring that it is accurate and time-worthy. The seven section of The Testing Practitioner cover materials found essential for test engineers and test managers working in real-world businesses. Following the syllabus this book deals with test principles, test process, test management, risk management, inspections and reviews, test techniques (both functional and non-functional), test process improvement, tools and people issues. Some of the specific topics included are test planning, risk based testing, completion criteria, estimation, static analysis, exploratory testing, performance testing, usability testing and data driven testing. This book is intended to meet the practical needs of both test engineers and test managers, especially those preparing for the ISTQB Advanced Test Analyst or Test Manager exam. A great reference for the new and experienced test practitioner applying test principles and structured testing to software development. This book may not contain all the answers you need, but is will surely set you of in the right direction.